Jaffray Eaton was born June 6, 1886, in Owen Sound, Grey, Ontario to Christopher and Annie Emma (née Jaffray) Eaton. Christopher was the co-owner of the Eaton Malt Company, a local brewery,1 and the family was well-known in the area. In his youth, Jaffray would attend the Owen Sound Collegiate Institute, and was going on to earn a BA in 1907. Prior to enlisting in the army, though, he was working as a manufacturer. At twenty-nine years old, Jaffray was found “fit for service” following a medical exam. He was 5’10”, with brown hair, grey eyes, and a fair complexion.3 He also had three scars: one on his left shin, another on his left forefinger, and a vaccine scar on his left arm. Jaffray's service forms were officially signed off by Lieutenant Colonel N.N. Stewart on October 20, 1915. Following this, he was assigned to the local Owen Sound unit, the 147th Battalion. 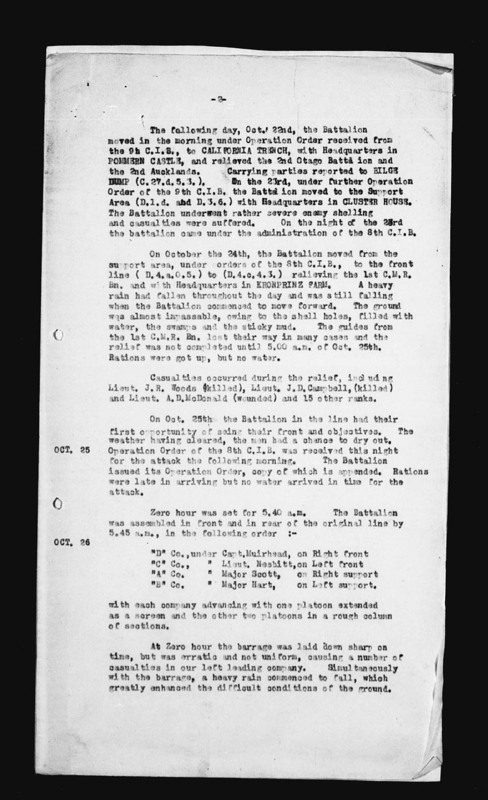 The Battalion was assembled in the front and in the rear of the original line by 5:45a.m... At zero hour the barrage was laid down sharp on time, but was erratic and not uniform, causing a number of casualties in the left leading company. Simultaneously with the barrage, a heavy rain commenced which greatly enhanced the difficult conditions of the ground. At zero hour the enemy opened a light barrage on the front line and supporters and a heavy machine gun fire on the front. Four officers and a number of other ranks become casualties almost at the outset.4 Jaffray Eaton was officially announced “killed-in-action on October 26th, 1917” at the age of 30 while serving near Passchendaele.3 Jaffray Eaton was only one of many soldiers who lost their lives during the attack near Passchendaele. The battle of Passchendaele was a muddy battlefield of loss and pain.